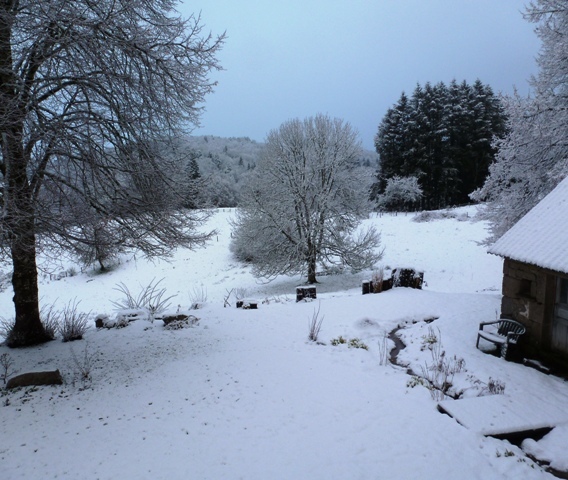 January and February are traditionally the coldest months here in La Corrèze. After a very mild, sunny Christmas and New Year, January turned into a deluge of rain accompanied by strong winds. Now, as we approach the middle of the month, the temperature has dropped to little above 0c and the rain has turned into sleet and snow or as météo.fr like to call it ‘quelques flocons.’ For the week ahead, the temperature is set to remain below 0c throughout the day and more snow flurries are on the horizon. 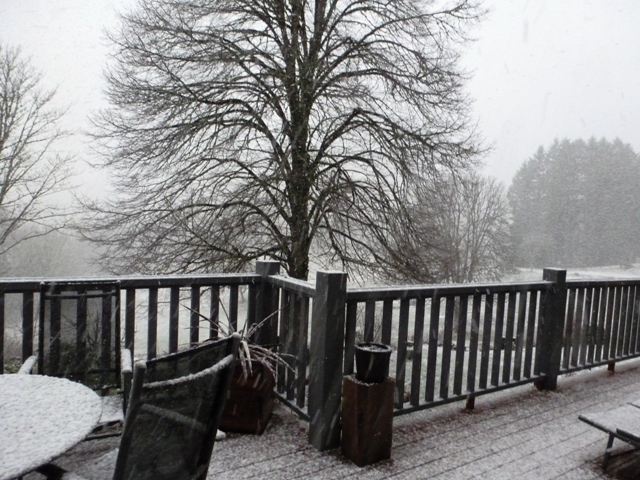 It’s never easy to predicate if you’ll be able to get out into the garden during these winter months. In order to be ready, whatever the weather, I’ve made myself a list of gardening jobs to last me throughout January and February. Jobs I can tackle outside if the sun is shining or inside if we’re under a blanket of snow! Cut back my Zebra grass, Miscanthus sinensis ‘Zebrinus.’ Old foliage of ornamental grasses should be cut back to within a few centimetres of the ground before new growth appears. 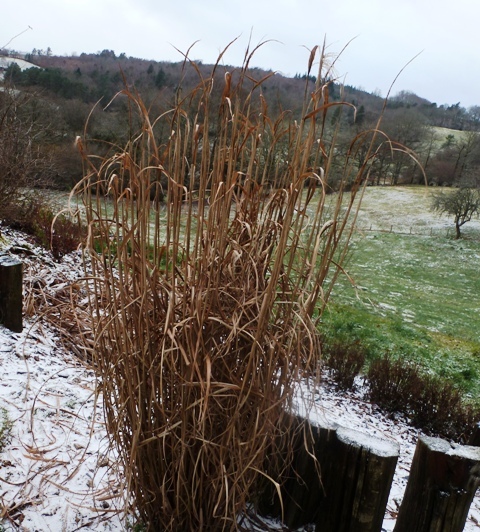 I like the look of grasses during the winter months, they add structure and interest to the garden, so I’ll be leaving this job until as late as possible. Clear away dead foliage and cut down old stems of perennial plants. Whilst some people cut back perennials as part of their late autumn garden tidy up, I leave some of mine until late winter. The dead flower heads not only add interest to the winter garden but can also provide food and shelter for insects. Which get the chop in late autumn and which make it until late winter? Well that tends to depend upon how they’re looking; some flop to the ground, others don’t! Here Hosta, Sedum and Astilbe usually get left until winter, Day Lilies and Crocosmia are usually cut back in late autumn. If leaving the job until late winter, as with any ornamental grasses, be careful not to cut into any of the new growth. Keep an eye on my Hellebore. 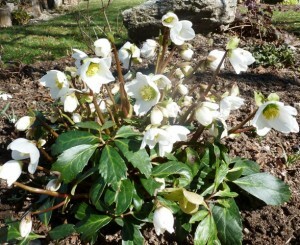 I love Hellebores, and I have a clumps of both Helleborus niger and Helleborus x hybridus dotted around the garden. These brave, delicate perennials flower in late winter, so to ensure that I can fully appreciate their beauty when little else is blooming, I remove older, larger leaves when the flower buds start to appear. Hellebores are also prone to disease, any leaves developing black marks should be removed immediately, and put in the dustbin, do not add to your compost heap. Prune pear and apple trees. I have to admit that pruning fruit trees is not one of my strong points, and it’s usually a job that gets left to my husband Paul to do. Remove some of the oldest branches as the best fruiting wood is between 1-4 years old and aim to create an open centre which will improve ripening and air movement around the fruit, thus discouraging disease. Wash empty plant pots. If like us you have a micro station d’epuration or fosse septic rather than being on mains drains this becomes an outdoor job. We have a petite source which runs through our garden, so this is made use of for washing my pots; definitely not a job for a freezing day! Check Dahlia tubers. My success with overwintering Dahlia tubers is somewhat hit or miss. Last year I decided not to dig them up and they survived fine in the ground, this year I have dug them up, so as in previous years they will no doubt not make it! I will be keeping a close eye on them this time to make sure that they are dry and showing no signs of rot. Clean greenhouse. I’ve already cleared out the greenhouse, but have not yet cleaned the glass in readiness for the new season. Again this job will be relegated to a warmer day! Plan my vegetable plot for the year ahead. One of my favourite jobs involving lots of paper and coloured pencils, it’s like being a little kid again! My vegetable plot isn’t very large so it’s a challenge each year to decide which vegetables should be planted where to ensure crops are well rotated. Crops need to be rotated to avoid the build up of pests and diseases in the soil and also to make the best use of nutrients. I’ll be expanding on this in my next blog. Sort through seed tubs and order in new seeds. I love doing this job on a cold Sunday afternoon with the wood burning stove blazing, a black and white movie on the television, seeds spread across the rug and perhaps a cheeky glass of wine to hand! Great fun! Start chitting potatoes. I haven’t bought my seed potatoes yet but I have already decided on which varieties I will be growing this year. Amandine, a first early which is ready to harvest 80-90 days from planting and Ratte, a delicious second early ready 100-120 days after planting, which is renowned for its distinctive chestnut flavour. For more information on French potato varieties, please see my earlier blog Get Chitting. I use egg boxes to stand my seed potatoes in and I’ve already started collecting them in readiness. They should be left to chit in a cool, bright, frost-free place. One of our spare bedrooms is perfect for this! I hope that this will give you a few ideas for jobs you can being doing this winter, come rain, shine or snow! I’d love to know what jobs you do in your garden in January and February,whether you be in France or further afield, so please do leave your comments in the box below.